Summer is definitely the best season for me! The desire to go on vacation and get that ultimate summer feeling is huge. Even when I’m thinking about the most wonderful trips I made, I’m getting that happy butterfly moment in my stomach. Your vacation can be even better if you know someone who knows the place by heart. I have travelled a lot trough Greece, since I have a Greek father, and it gets even better every time. I think the recipe of a great vacation experience is the balance of the right place, good company and knowing where to go. So from now on you will have me for your travel inspiration and must go’s. One of my favorite islands in Greece is Santorini. It’s just the right place to be… And you, as a Fashionista, are looking for this kind of special places right? Santorini is a place you won’t find anywhere else in the world. Nothing in the world you have already seen can compare to the sights this beautiful island offers. It’s one of the most visited islands in the world because of the mind stunning sunsets, the impressive traditional houses and the mystery and charm. When people talk about the island with the cute white houses and the blue roofs, it’s definitely about Santorini (The crown jewel of Greece). Santorini was formed by catastrophic volcanic explosions over thousands of years. The results are a wonderland of cliffs, volcanic rocks and a breathtaking ocean view. Santorini is the perfect island to combine with visiting other islands. So my advice is to stay here around 4 days if you decide to do some island hopping. The two ways of reaching the island is by air or by fast ferry. The best way to get around the island is by jeep or by scooter. But if you decide to go by scooter, be careful, Greek people drive like crazy! If you really want to experience the Santorini feeling I would recommend you to stay in Fira or Oia. These are the towns on the cliffs, which are very beautiful and full of little cafes, shops and places of interest. You will find so many beautiful small villa apartments and hotels that are hidden into the cliffs. Aqua Vista Hotels are well known in Greece and these hotels never disappoint me. You can also check Adamant Suits in Fira and Canaves in Oia. I used to stay in both hotels and they where super! Santorini’s coastal treasures have been profoundly influenced by the volcanic nature of the island. You can expect deep blue water, white, black, and red sand. Some people like them, but some people don’t. But even with this contrast of taste, these kinds of beaches you will find nowhere else. I love the beaches because they belong to the island and they are different than other islands. This is my favorite beach in Santorini! The water is amazing and there are several kilometers of black sand beaches. Watch out for your feet because the sand is so extremely hot!  For the best beach service you need to go to the famous Seaside by Notos at the very beginning of the beach. Confortable sun beds where you can stretch out and enjoy the perfect summer day. Seaside by Notos is glamorous and a perfect spot for a great lunch. I can stay here all day long. If you wane go to another place which is not to far, go to Anemos beach bar for a refreshing cocktail. This bar it situated in the yard of an old tomato factory. I will mention a few restaurants where I love going every time I’m in Santorini. But there are many more places to discover for you. Especially during the day for lunch, you can go by scooter and check out cute taverns. 1800 Restaurant is located high up on a cliff on the northern tip of Santorini and has a spectacular view of the Caldera and the Aegean Sea. Every time I’m here I’m totally blown away by the view and this amazing restaurant. The service is perfect and every dish on the menu is good. Not every Greek island has a good sushi place but this place is a must go! First of all it’s a cute small place with a great atmosphere. There is always a beautiful crowd who is super well dressed. Love to get inspired by other people. The food is amazing and besides my best experience of sushi in Panama and New York this is also a place I cant forget. There is also a very special dish on the menu; raw beef served on a hot black Santorini lava stone, for cooking your own beef. It’s just perfect. This restaurant is located in the middle of Fira. It seams to be very touristic and somehow it is. Usually I’m not a big fan of the tourist spots but the food is amazing. And the other spectacular about this restaurant is the location. The restaurant is built on the cliff and when you reserve a table at the terrace it’s like you’re floating above the water. I can’t even describe how spectacular the view is.. I never get bored of it. Greek salad: The tomato’s that grow on Santorini may be the best tasting tomatoes you will ever have. Fava: this dish is traditionally from Santorini. It’s made from the Fava bean (yellow split peas). It’s like a vegetarian spread which is creamy and super tasty. They serve it with red onion, capers and olive oil. You have to taste this with bread.. Super delicious and healthy! Melitzanosalata: White eggplant puree. Delicious and the best eggplant salad I ever had in my life is here in Santorini. Tomatokeftes: Tis dish is also called tomato rissoles. It’s a traditional dish from Santorini made with fresh mint, parsley and paprika, tomatoes and onions. Going out in the evening is like a fairy tail. All the beautiful lights and the reflection of the moon is magical! Most of the bars and nightlife you will find in the town Fira. Oia has also bars but it’s more quiet but has classy cafes and bars. Many places along the caldera are actually built into renovated cave houses. While walking you will find a lot of great bars. Make sure you check out Tango Bar in Fira and Koo Club! Dress to impress! Another precious heritage from Santorini, which you don’t want to miss, are Santorini’s vineyards. The power of the volcanic oil gives the fantastic grape variety “assyrtiko” a special and charismatic identity. Santorini wines, made from this variety, stand today among the most popular wines in Greece. For a totally different experience, you should go on a wine tasting excursion with a small group. It’s totally worth it to discover and learn more about the history of the wine and you will get to know this unique island even better. One of the things you have to see is the open-air cinema. In Kamari village there is a super romantic small open-air cinema. When the sun goes down and you’ve enjoyed a delicious meal in Fira or Oia, I would highly recommend you to check out this place. It’s just an experience to sit down in one of the hundred seats, with a great temperature, surrounded by a flower garden, and enjoying the movie and your company. You can’t miss the airplanes flying over, reminding you sitting in a open air cinema in Santorini. There are many catamarans you can rent and go to the Caldera (volcano) and get an unforgettable day. The water is hot because you are close to the volcano. It’s great to go with a small group and walk towards the top of the island and see the active crater. You can also swim into the springs, which created thousand years ago by the underwater power of the volcano. 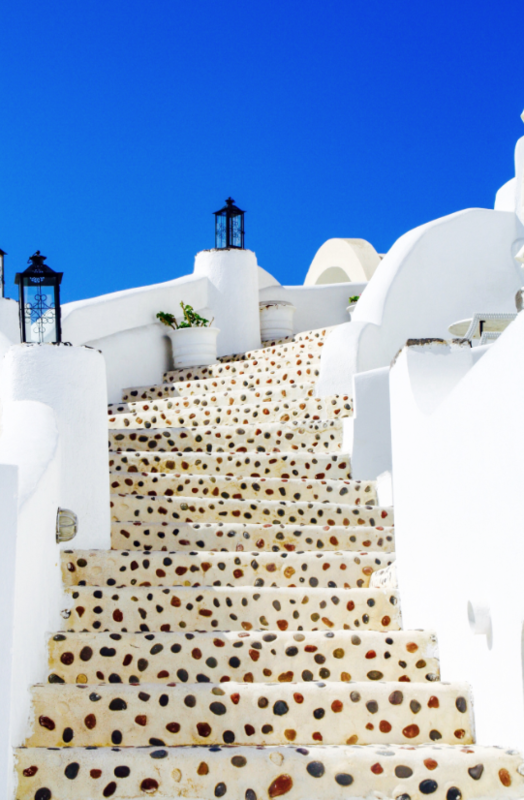 Santorini has a lot of small shops and the best advice is to put on your sandals and walk through the idyllic streets. You will see how many shops they have with jewelry, clothes, etc. Perfect place to spot some unique accessories  I bought my favorite sandals in Santorini which are definitely a must have! I have them in many colors and they fit perfect. Every year my friends ask me to bring them a new pear of sandals. I’m sure you love them!